The winner will be determined by 100% viewer voting (which makes it rather unfair if you ask me because it turns the most prized acting award of the year into a popularity contest). But that decision all done with. Look at how cute Seo Inguk and Nam Jihyun are though!!! Kyung Soojin (Weightlifting Fairy Kim Bokjoo) and Yoon Hyunmin (Beautiful Mind) presented the Best New Actor/Actress Awards. And golly does Kyung Soojin look stunning. I love how happy Lee Sungkyung looks when the camera panned to her at that point. The cast seems to be quite tight. Hello, I’m Nam Joohyuk. I find it amazing and heart-fluttering when such surprising things happen. I’ll take this as a sign to keep working harder and I’ll keep doing so. And…PD Oh Youngjong,Writer Yang Heeseung, thank you. And, to my mom who’s watching this at home, I love you. Thank you. Rather than me being up here alone, I see this as a position where everyone should be up here with me. Thank you for giving me such an important award. I’m really proud and thankful. First off, thank you to the writer, director and my colleagues, and staff. There isn’t much left of this year. Though there were a lot of difficulties, there were lot of things that gave us hope. Though there will undoubtedly be difficulties next year, don’t forget that hope and that love and try to search it out. I hope we’ll all be happy. Finally, I deliver this honour to God. Thank you. First of all, to Inguk-oppa, Semi-unnie, PD Lee Sanghyuk, Uhn Hyesoo sunbaenim sitting at the Shopping King Louis table. And to And to scriptwriter Oh Jiyoung who’s not here, and Yoon Sanghyeon sunbaenim. To everyone in Shopping King Louis, I’m really grateful. It was really fun filming with everyone. I had this much fun filming for the first time in life. This drama gave me such good memories and I’m glad as Bokshil that we gave such good memories and energy to viewers as well. I think I became a more loveable person thanks to writer Oh Jiyoung’s creation of such a loveable character. I hope this year ends well, and that everyone has a happy new year. And thank you to my lovely parents and family. And than you to my company and my staff for always working so hard. Thank you. 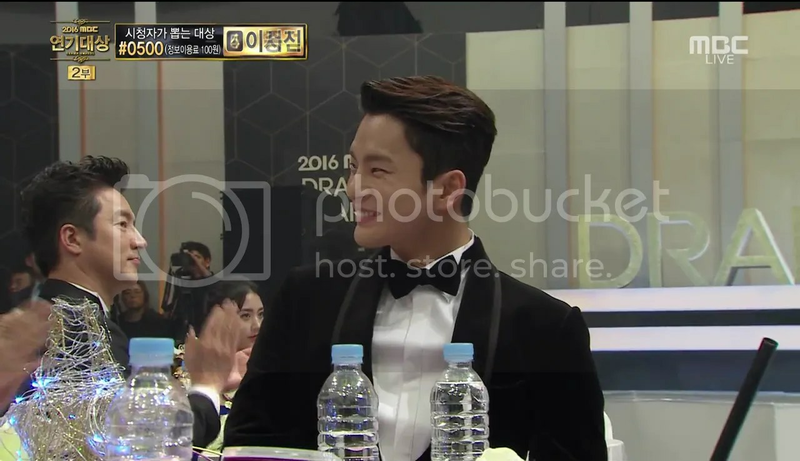 Aww, look at Seo Inguk’s face. I didn’t expect to win. I wish I’d prepared a speech. This award belongs to the PDs and writers of Monster. I wants to share this honor with everyone at Sidus Entertainment and my parents. I’ll take this award to mean that I should continue to work harder thankfully. Thank you. Next up, the Best Child Actor/Actress awards presented by last year’s winners Yang Hanyeol (Little Park Seojoon in She Was Pretty) and Gal Soweol. Scriptwriter Award: W: Two World’s Song Jaejeong. 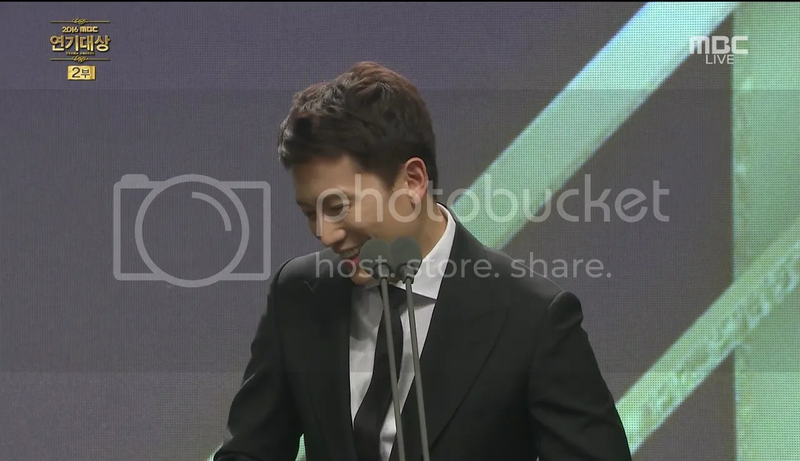 Kim Euisung (No Face, Oh Sungmoo) accepted the award on the writer’s behalf. Thought this was an award I’m getting as writer Oh Sungmoo (haha), but it’s writer Song Jaejong’s award. I’ll accept this award on her behalf. I asked her what kind of speech I should make but she told me to just go for whatever I wanted. So I will. When reading W’s script, I was always surprised and always curious. We were all glad to work with such a great writer. I sincerely congratulate you on this award, Writer Song Jaejong. Lee Sangwoo-Kim Soyeon (Happy Home) <– and real life couple! Kim Euisung-Lee Shi Un (W: Two Worlds) HAHA!! LJS: Ah, thank you. Noona’ll do the speech. HHJ: You always leave it to me. LJS: Because I’m not that great at talking. Please do it, Noona. HHJ: Fine, alright. Thank you. Receiving so much love due to W was great as is, working with Jongseok, who’s like a manhwa come to life in real life was also great. Receiving this Best Couple award means that there were that many viewers who loved us, so it feels like an award that belongs to you as well. Thank you very much. [To LJS] Say something too. LJS: Thank you so much for loving W. Happy New Year. Love you all. Thank you. MC: Now, onto the person who made every Bokshil in the nation’s heart burst. SEO INGUK!!! Seo Inguk-sshi, viewers have been saying that this role would have been impossible to pull off, were you not the one playing it. MC: What do you think about that? Whoa, he’s moving his chair so that Nam Jihyun’s in the shot as well. So caring! So why do you think the show did so well? SIG: Of course it’s because of Nam Jihyun. MC: Did you just attempt to hit him? MC: So what about Nam Jihyun was it? MC: Yes, please be serious. SIG [laughing]: Well, what I liked most was that we thought the same way. At the filming venue, when creating scenes, the director and everyone here had their own style, so the scenes in the script and extra fun bits and pieces were added in because of that. MC: I see. Now, Louis is a king of shopping. What are you king of? SIG: In my case…[audience screams] Hmm? MC: They’re saying it at the back. The answer is kissing! King of Kissing, Seo Inguk. MC: Once these scenes aired, everyone said that you were the king of kissing. So how passionately did you kiss Nam Jihyun? MC: Let’s ask her. How was it, Nam Jihyun-sshi? It was exciting, wasn’t it? NJH: Thanks to him, I was able to film those scenes without being nervous. It was quite comfortable. MC: He led very well, didn’t he? MC: You seem to want to act again with him. NJH: If there’s a chance, then I will. MC: With a kiss scene, of course. MC: Bokshil speaks in a Gangwondo dialect, right? Can you convey how she feel right now in this award show setting? MC [in satoori]: I trust you too. Thank you. Finally, Seo Inguk-sshi. MC: You’re a Daesang nominees. MC: People undoubtedly have ambitions. How do you feel right now? SIG: Earlier too, I was rather surprise. Just being nominated up there feel likes the peak of my career. Seriously. MC: Yeah, that’s what everyone’s being saying. SIG: Spit keeps coming out. NJH: These days, strangely, compared how you look when weightlifting or exercising, seeing you wear a dress is…very…very…surprisingly. LSK: Jung Joonyoung, you also look a biit handsome today. 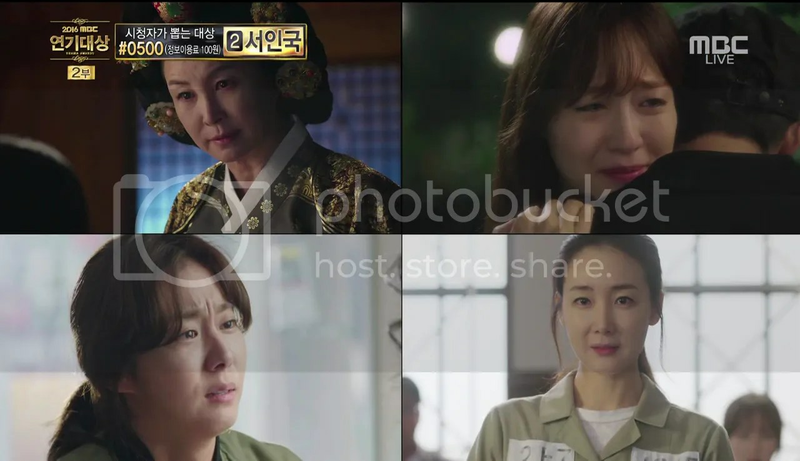 [returns to herself] Though we’re receiving a lot of love in our current drama, we also walked the runaway for few years together. NJH: Sure did. Sungyung-sshi, I mean Bokjoo-yah. It feels really good to wear clothes that suit you well, doesn’t it? LSK: Yeah. Acting seems like the same thing. Just like the effort models put in to wear clothes, actors also put in a great deal of effort to become their character. NJH: Just like there are top-models who sell out clothes, there are actors who become their characters really well. LSK: This award is for them. I was so certain I would get the Best Couple Award (HAHA!) but this award’s made up for that disappointment. 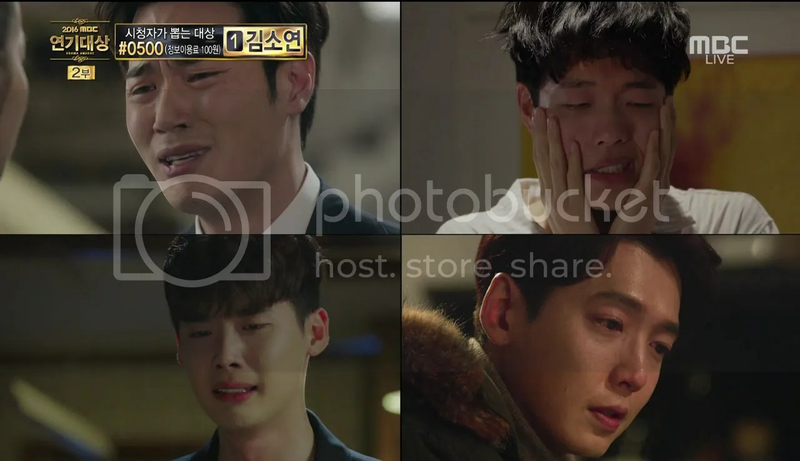 Thank you to the writer, PD, all the staff, Jongsuk-sshi, Hyojoo-sshi, Shi Un-sshi, and all my colleagues. I share this award with you. I also want to thank the Entourage team. My last MBC drama was in 1997. To be back here in 20 years in an honour and I’m grateful to have received an award. It feels like coming home after a long time. I may have come home like this, but there are people who have left home and haven’t returned in our society, even when it’s this dark. I hope we create a society together where they can return to their homes, their workplaces and their places in life. Thank you. Thank you so much. This is my first time in this position. 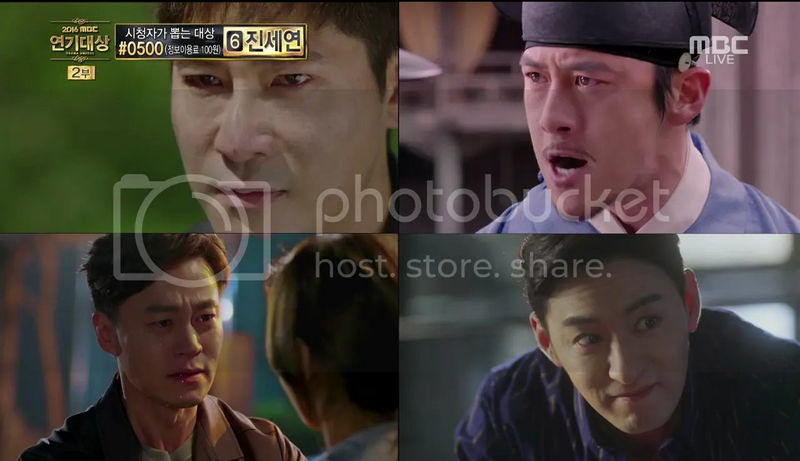 Thank you to the writer and PD for giving me such a loveable villainous role. And to my colleagues, sunbaenimdeul, and all the staff, I’m here because of you. I was very happy during filming just like Jihyun-sshi, And with all the viewers…[aww, she starts to cry] Thank you, it’s because of you. And to everyone at CJES. I won’t forget this and continue to work hard. Thank you to my family. Everyone stay healthy and be happy. Thank you. Choi Taejoon and Jung Dabin of Flower in Prison presented the Excellence Awards (우수상) for the Mid-length drama category. Jung Kyungho and Baek Jinhee of upcoming drama Missing 9 (which looks AMAZING) presented Excellence Awards (우수상) for the Weekend/Daily drama category. Jinyoung and Baro of B1A4 presented the Excellence Awards (우수상) for the mini-series category. Love the winners’ reactions! Speech: Aigoo, thank you so much. This feels really good, it really does. 2016, for me, has really been a meaningful, difficult year. When I first started Shopping King Louis, there wasn’t enough time between my last work when I met this character. The people around me had some worries about whether I could pull it off, but PD Lee Sanghyuk, who’s here today, trusted me. And I really want to convey how thankful I am for how much love our drama received. So, I want to share this award with the viewers who loved us and those who trusted us. In 2017, I hope you all continue to smile. [He actually giggles, so cute]. I will continue to work hard. Ah, wait. Everyone says that so I’ll say “I’ll do well”. Thank you. To God whom I love, I give all this honour. Waaah. Last year, I gratefully accepted the New Actress Award, and I never imagine receiving the Excellence Award a year later. First of all, to PD Oh Wonjeong who introduced me to Bokjoo’s character, thank you. Thank you writer Yang Heeseong for helping me act well, comfortably and prettily. And I think I was also able to act comfortably because of the staff’s help. Thank you to the actors and staff. And to the guy who makes Bokjoo so lovable, Joonyoung-ie. Thank you, Joohyuk. Thank you Soojin-unnie for being in the same drama, dealing with very difficult emotions and cheering Bokjoo on. And thank you Jaeyoon oppa for being so cool, enough that Bokjoo fell for him. Seeing as it’s an award that many people allowed me to receive, I will work hard to become a better actor. Thank you. 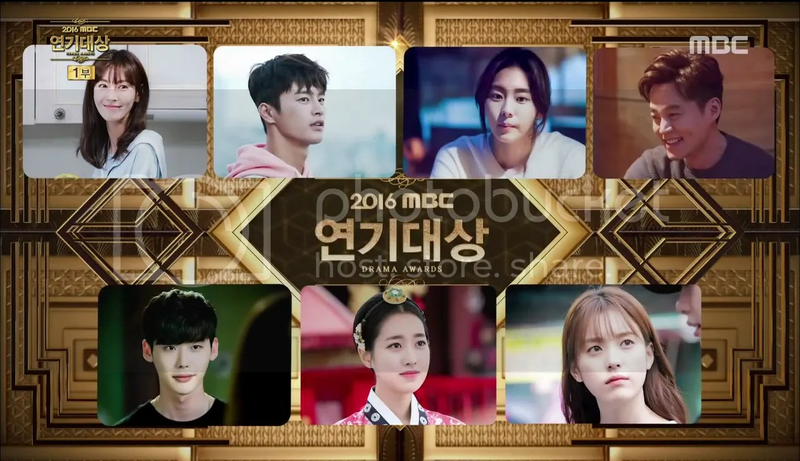 A few parodies are shown and Lee Jongseok and Han Hyojoo are interviewed for a bit by Park Seulgi. Jung Jinyoung and Jin Seyeon present the Top Excellence Awards (최우수상) for the mid-length series category. 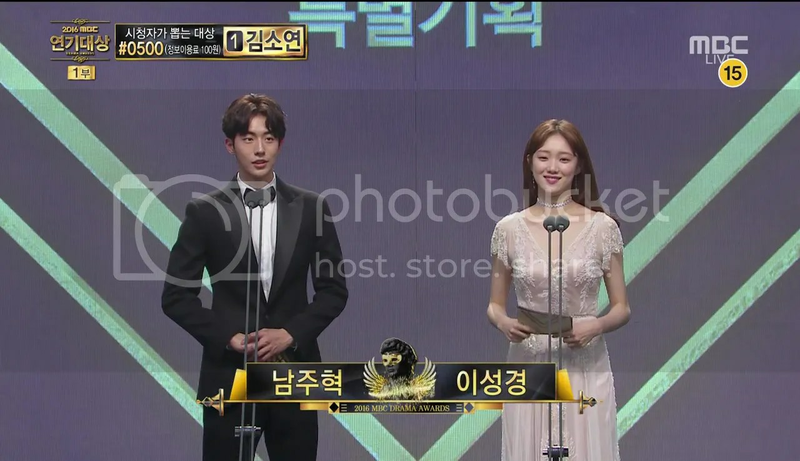 Song Chang-eui and a gorgeous Lee El presented the Top Excellence Awards for the Weekend/Daily drama category. Im Siwan and Yoon of upcoming drama The King Loves presented the Top Excellence Awards for the mini-series category. Speech: Thank you. Thank you to the PD and writer. Hyojoo-noona, Euisung-hyung. Oh, I just said Euisung-hyung. Euisung-sunbaenim. Shi Un hyung, thank you. And I heard today’s YG’s CEO, Yang Hyun Suk’s birthday. Happy Birthday. I love you, mom and dad. Thank you to all my fans. Thank you. Thank you. I always feel like I’m receiving more than I give, so I feel quite sorry. I don’t think this award is for me alone. Those at the drama’s filming, all the staff that worked hard, and the scriptwriter who wrote such a great script, and PD, our manhwa-character Kang Chul, my dad Euisung sunbaenim, Shi Un oppa and all the actors, thank you so much. And to the viewers who loved W, and all the fans that have been cheerign me on throughout the years. Even at the end of the year you’ve been working hard. I hope that next year will be wonderful for you all. Happy New Year. Thank you. 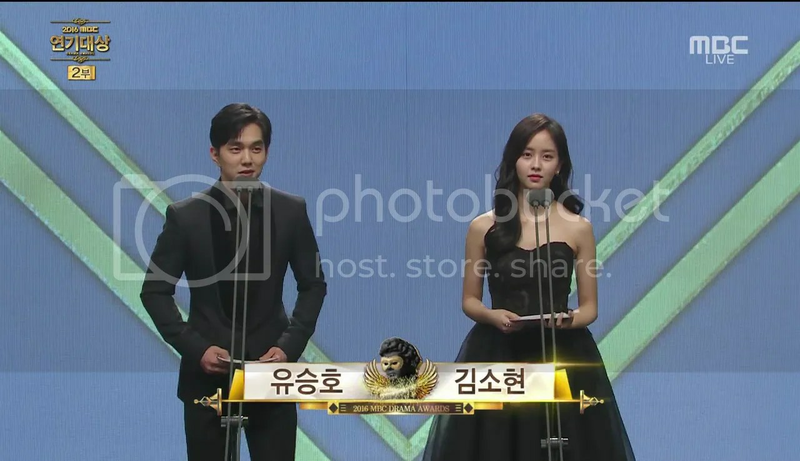 Yoo Seungho and Kim Sohyun of up coming sageuk The Ruler-Master of the Mask teamed up to present the Drama of the Year Award (올해의 드라마) as voted for by viewers. They also promised to do their best to ensure that their drama will be nominated for this award, next year. The director accepted and gave a speech. The MBC vice-president came along and asked Ji Sung which of the the 7 personalities he was today and (squee!!!) Ji Sung recited a variation of that swoonworthy line both Dohyun and Segi said. Then he gets embarrassed, the cutie. JS: Thinking about Kill Me Heal Me after a while makes me miss it. Because of you all, it was very meaningful for me. He goes onto say that a Daesang is more than a single actor’s work, but the cumulative effort of those around him, all the staff and other actors, writers, and PD. 13,000 people voted. 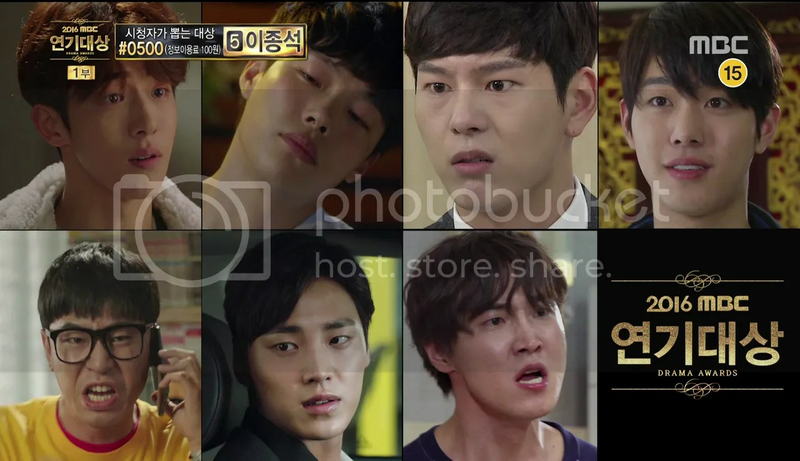 And the winner is…LEE JONGSEOK!!! Speech: Unlike everyone else, I’m not very good with words. But, thank you. Yoonsung hyung, and Donggu, Joonho, thank you. Thank you to my fans. Thank you. I’ll work hard. MC Kim Gukjin came on stage to try and get him to say more. MC: Surely you have other people you want to thank, right? A little back, you received a Top Excellence Award, right? Did you think that you had perhaps lost your chance to win the Daesang once you received that award? MC: But you still won it. MC: Please say everything you want to say. LJS: I was getting a bit sleepy but seeing as it’s about to end, my heart keeps beating. Yes, thank you. MC: Seeing you up-close, you really do look like a manhwa character. Have you said everything you want to say? 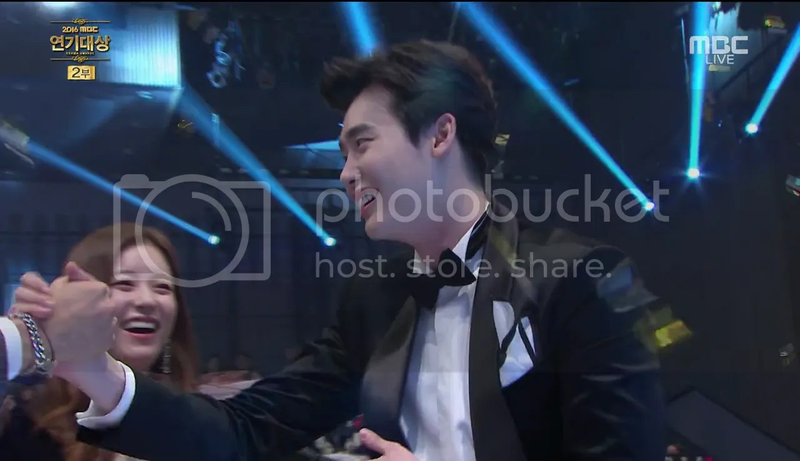 MC: Finally congratulations Lee Jongseok once again. thank you love your translation and recap.